In this paper we prove non-existence of nontrivial partial difference sets in Abelian groups of order \(8p^3\), where \(p\ge 3\) is a prime number. These groups seemed to have the potential of admitting at least two infinite families of PDSs, and even the smallest case, \(p=3\), had been open for twenty years until settled recently by the authors and E. Neubert. Here, using the integrality and divisibility conditions for PDSs, we first describe all hypothetical parameter sets of nontrivial partial difference sets in these groups. Then we prove the non-existence of a PDS for each of these hypothetical parameter sets by combining a recent local multiplier result with some geometry and elementary number theory. This material is (partially) based upon work done while Stefaan De Winter was serving at the National Science Foundation. 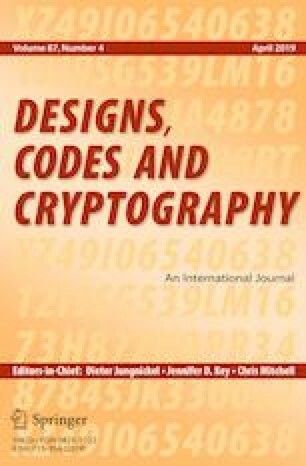 This is one of several papers published in Designs, Codes and Cryptography comprising the “Special Issue on Finite Geometries”.